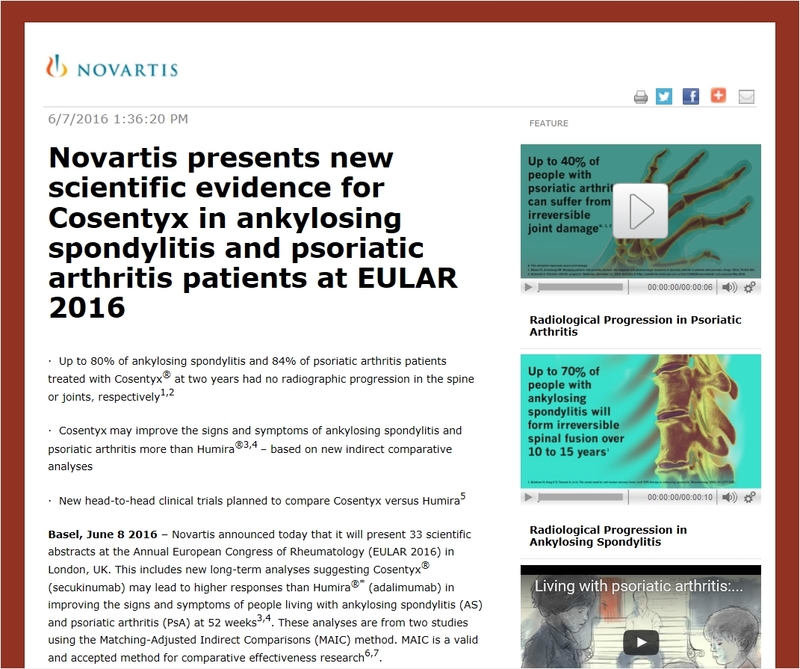 Basel, June 8 2016 - Novartis announced today that it will present 33 scientific abstracts at the Annual European Congress of Rheumatology (EULAR 2016) in London, UK. This includes new long-term analyses suggesting Cosentyx® (secukinumab) may lead to higher responses than Humira®* (adalimumab) in improving the signs and symptoms of people living with ankylosing spondylitis (AS) and psoriatic arthritis (PsA) at 52 weeks,. These analyses are from two studies using the Matching-Adjusted Indirect Comparisons (MAIC) method. MAIC is a valid and accepted method for comparative effectiveness research,. To directly compare Cosentyx versus Humira, Novartis plans to initiate new head-to-head studies in patients with AS and PsA. These will be the first ever adequately powered long-term head-to-head studies with biologic medicines to differentiate the effectiveness of treatment in these conditions. "There is an urgent need for new ankylosing spondylitis and psoriatic arthritis treatments because a significant number of patients do not respond well to anti-TNF therapy, the current standard of care," said Vasant Narasimhan, Global Head, Drug Development and Chief Medical Officer, Novartis. "There is a growing body of evidence that supports the potential of Cosentyx to become a gold standard of care for patients living with these debilitating conditions." Also presented at the Annual European Congress of Rheumatology (EULAR 2016) were two-year data showing that up to 80% of AS patients on Cosentyx had no radiographic progression in the spine on x-ray assessment. A similar proportion of patients with PsA (84%), who were on Cosentyx for two years, also had no evidence of progression. More than 9,600 patients have been treated with Cosentyx in clinical trials across multiple indications, and over 20,000 patients with psoriasis have already been treated in the post-marketing setting. The safety profile of Cosentyx was shown to be consistent with that seen in clinical trials across multiple indications-. While these MAIC analyses have been performed using data from randomized controlled trials, there are limitations to these analyses due to differences in study designs and lower effective sample size for Cosentyx. In addition, only publicly available data has been used for Humira. This impacts availability of comparative data and matching of patient populations in these studies. Further technical details on the MAIC analyses are available in the presented scientific abstracts,. Cosentyx is a fully human monoclonal antibody that selectively neutralizes circulating IL-17A. Research suggests that IL-17A may play an important role in driving the body's immune response in psoriasis, AS and PsA,. Cosentyx is approved in more than 50 countries for the treatment of moderate-to-severe plaque psoriasis which includes the European Union countries, Japan, Switzerland, Australia, the US and Canada. In Europe, Cosentyx is approved for the first-line systemic treatment of moderate-to-severe plaque psoriasis in adult patients. In the US, Cosentyx is approved as a treatment for moderate-to-severe plaque psoriasis in adult patients who are candidates for systemic therapy or phototherapy (light therapy). In addition, Cosentyx is the first IL-17A inhibitor with positive Phase III results for the treatment of active AS and PsA- and is now approved in Europe, the US, and other countries for these conditions. Cosentyx is also approved for the treatment of PsA and pustular psoriasis in Japan. AS is part of a family of life-long inflammatory diseases that also includes PsA. It generally results in serious impairment of movement in the spine and physical function, which has an impact on quality of life. People in their teens and twenties, particularly males, are affected most often. Family members of those with AS are at higher risk,. Improvements in the symptoms of AS are measured by the ASAS response criteria (ASAS20), which is defined as an improvement of at least 20% and absolute improvement of at least 10 units on a 0-100mm scale in at least three of the following criteria: improvement in flexibility, night time pain, ability to perform specific tasks, morning stiffness, and no further deterioration in the condition. The percentage of patients reaching an ASAS20 response is an accepted way of measuring the efficacy of treatments in AS. PsA is part of a family of life-long inflammatory diseases that also includes AS. It is also closely associated with psoriasis. Approximately 30% of patients with psoriasis have PsA and as many as one in four people with psoriasis may have undiagnosed PsA. Symptoms of PsA include joint pain and stiffness, skin and nail psoriasis, swollen toes and fingers, persistent painful swelling of the tendons, and irreversible joint damage. Up to 40% of people can suffer from joint destruction and permanent physical deformity. Improvements in the symptoms of PsA are measured by the ACR response criteria, which has three levels - ACR20, 50, 70. In ACR20 there is an improvement of 20% or greater of the following criteria: reduction in the number of tender joints; reduction in the number of swollen joints; and a reduction in three of five additional criteria, which are the patient's assessment of pain and/or the patient's assessment of how active his or her PsA is, the physician's assessment of disease activity, levels of disability measured by the Stanford Health Assessment Questionnaire, and laboratory tests showing if inflammation is active. The ACR50 and ACR70 use the same criteria as ACR20, but are looking for a higher percentage improvement (50% and 70%) instead of 20%. *Humira is a registered trademark of AbbVie Inc. The foregoing release contains forward-looking statements that can be identified by words such as "may," "planned," "will," "suggesting," "plans," "growing," "potential," "suggests," or similar terms, or by express or implied discussions regarding potential new indications or labeling for Cosentyx, or regarding potential future revenues from Cosentyx. You should not place undue reliance on these statements. Such forward-looking statements are based on the current beliefs and expectations of management regarding future events, and are subject to significant known and unknown risks and uncertainties. Should one or more of these risks or uncertainties materialize, or should underlying assumptions prove incorrect, actual results may vary materially from those set forth in the forward-looking statements. There can be no guarantee that Cosentyx will be submitted or approved for any additional indications or labeling in any market, or at any particular time. Nor can there be any guarantee that Cosentyx will be commercially successful in the future. In particular, management's expectations regarding Cosentyx could be affected by, among other things, the uncertainties inherent in research and development, including unexpected clinical trial results and additional analysis of existing clinical data; unexpected regulatory actions or delays or government regulation generally; the company's ability to obtain or maintain proprietary intellectual property protection; general economic and industry conditions; global trends toward health care cost containment, including ongoing pricing pressures; unexpected safety, quality or manufacturing issues, and other risks and factors referred to in Novartis AG's current Form 20-F on file with the US Securities and Exchange Commission. Novartis is providing the information in this press release as of this date and does not undertake any obligation to update any forward-looking statements contained in this press release as a result of new information, future events or otherwise. Braun J, et al. Effect of secukinumab, an interleukin-17a inhibitor, on spinal radiographic changes through 2 years in patients with active ankylosing spondylitis: results of the phase 3 study, MEASURE 1. Abstract #3177 presented at the 25th European League Against Rheumatism Congress. 2016, June 8 - 11; London. Kavanaugh A, et al. Secukinumab provides sustained improvements in the signs and symptoms of active psoriatic arthritis: 2-year efficacy and safety results from the Phase 3 randomised, double-blind, placebo-controlled trial, FUTURE 1. Abstract #3565 presented at the 25th European League Against Rheumatism Congress. 2016, June 8 - 11; London. Maksymowych W, et al. Secukinumab for the treatment of ankylosing spondylitis: comparative effectiveness results versus adalimumab using a matching-adjusted indirect comparison. Abstract OP114 presented at the 25th European League Against Rheumatism Congress. 2016, June 8 - 11; London. Nash P, et al. Secukinumab for the treatment of psoriatic arthritis: comparative effectiveness results versus adalimumab up to 48 weeks using a matching-adjusted indirect comparison. Abstract THU0448 presented at the 25th European League Against Rheumatism Congress. 2016, June 8 - 11; London. Novartis. Data on file. May 2016. Ndirangu K, et al. Trends in the use of Matching-Adjusted Indirect Comparisons in published literature and NICE technology assessments: A systematic review. PRM161. Value in Health. 2016; A99 (19). Thom H, et al. Matching Adjusted Indirect Comparisons to assess comparative effectiveness of therapies: Usage in scientific literature and health technology appraisals. PRM167. Value in Health. 2016; A100 (19). Baeten D, et al. Secukinumab, interleukin-17A inhibition in ankylosing spondylitis. N Engl J Med. 2015; 373:2534-48. McInnes IB, et al. Secukinumab, a human anti-interleukin-17A monoclonal antibody, in patients with psoriatic arthritis (FUTURE 2): a randomised, double-blind, placebo-controlled, phase 3 trial. The Lancet. 2015; 386(9999):1137-1146. Mease PJ, et al. Secukinumab inhibition of interleukin-17A in patients with psoriatic arthritis. N Engl J Med. 2015; 373(14):1329-39. Kirkham BW, et al. Interleukin-17A: a unique pathway in immune-mediated diseases: psoriasis, psoriatic arthritis and rheumatoid arthritis. Immunology. 2014; 141:133-142. Ivanov S, Linden A. Interleukin-17 as a drug target in human disease. Trends Pharmacol Sci. 2009; 30(2):95-103. Cosentyx Summary of Product Characteristics. Novartis Europharm Limited. Available at: http://www.ema.europa.eu/ema/index.jsp?curl=pages/medicines/human/medicines/003729/human_med_001832.jsp&mid=WC0b01ac058001d124. Accessed April 2016. American College of Rheumatology (ACR) website. "Spondyloarthritis": http://www.rheumatology.org/I-Am-A/Patient-Caregiver/Diseases-Conditions/Spondyloarthritis. Last accessed April 2016. Committee for Medicinal Products for Human Use. Guideline on clinical investigation of medicinal products for the Treatment of ankylosing spondylitis. London: European Medicines Agency; 2009. Available at: http://www.ema.europa.eu/docs/en_GB/document_library/Scientific_guideline/2009/09/WC500003424.pdf Last accessed April 2016. Zachariae H. Prevalence of joint disease in patients with psoriasis: implications for therapy. Am J Clin Dermatol. 2003; 4:441-7. National Psoriasis Foundation. "Nearly one in four people with psoriasis may have undiagnosed psoriatic arthritis." ScienceDaily. Available at: www.sciencedaily.com/releases/2011/10/111012153755.htm Last accessed April 2016. Anwar AH, Diamond H. Psoriatic arthritis: practice essentials, background, pathophysiology and etiology. Medscape reference website: http://emedicine.medscape.com/article/2196539-overview#a6. Last accessed April 2016. Committee for Medicinal Products for Human Use. Guideline on clinical investigation of medicinal products for the psoriatic arthritis. London: European Medicines Agency; 2006. Available at: http://www.ema.europa.eu/docs/en_GB/document_library/Scientific_guideline/2009/09/WC500003413.pdf Last accessed April 2016.